Just about any sports fan today has at least heard of the famous tennis match between women’s champion Billie Jean King and the 55-year-old hustler and former champion Bobby Riggs. Few know about the build up to the match: the money, the sponsorships, the agreements and disagreements. That this match even happened is a miracle. In Billie’s place went Margaret Court, a tough Australian, who was expected to give Bobby a good match. To avenge her gender, Billie Jean King threw herself into the proverbial arena—The Houston Astrodome, in this case. Riggs is a shameless self-promoter, trying to live just a little bit longer off of his glory days. King is a feminist, one of the reason women make huge amounts of money today. She and Chris Evert really started women’s tennis fandom back in the 1970’s. The hype for the match was huge. We see Riggs (Ron Silver) schmoozing, trying to squeeze out more money here and there. 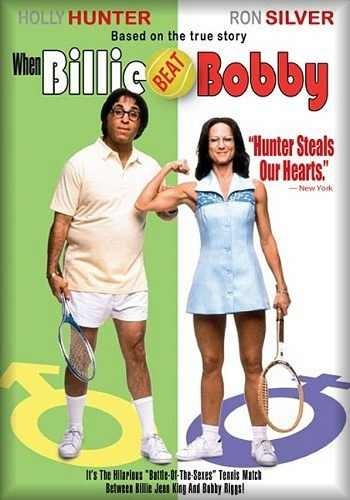 ; Silver disappears amazingly into Bobby Riggs. Then we see King (Holly Hunter) practicing till she wears out her practice partner. A man, by the way. This entry was posted in Academy Award Nominees, Based on a True Story, Films, Films Watched in 2014, Sports, Television. Bookmark the permalink.